2013 Skoda Octavia vRS prices announced | What Car? 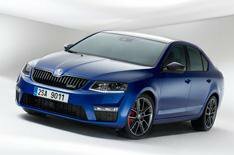 The 2013 Skoda Octavia vRS will cost from 22,990. It is also available as an estate, with prices starting 800 more, at 23,790. These prices are for the 217bhp 2.0-litre petrol engine with a six-speed manual gearbox. Skoda is also offering a diesel version, which uses the 181bhp 2.0-litre engine from the Volkswagen Golf GTD. Both engines are also available with a DSG automatic gearbox. The petrol-powered car completes the 0-62mph sprint in 6.8 seconds, while the diesel takes 8.1 seconds and has a top speed of 144mph. Both versions sit lower than the standard car the hatch by 12mm and the estate by 13mm. They come with 18-inch alloys, rear parking sensors, Bluetooth, DAB radio, touch-screen, dual-zone air-conditioning and engine stop-start. The vRS gets the same interior dimensions as the standard Octavia, with the hatch offering 590 litres of boot space, while the estate has 610 litres. The two Octavia vRS bodystyles are available to order now, with deliveries from August 1.